Japanese Episode DP 016: "Zugaidos vs. Pikachu!" American Episode 480: "A Gruff Act To Follow!" Satoshi's battle against Hyouta is about to be underway! 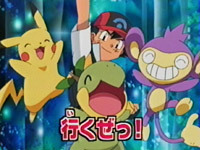 After watching Shinji give his Marilli away to another young trainer, Satoshi decides to use Naetle, Aipom, and Pikachu against Hyouta's team of rock-types. As Satoshi prepares for his battle, the Rocket-Dan, posing as mine workers, are given a tour of the city's museum. Inside the museum is a giant fossil reviving machine that the Rocket trio plans to steal. Elsewhere, the battle for Satoshi's first Shinou League Gym Badge begins with Satoshi's Aipom against Hyouta's Zugaidos. Aipom is able to get a few good Focus Punches in, but the speed of the rock-type's pokemon wipes out Aipom's defenses. The monkey pokemon loses the first round, so Satoshi chooses Pikachu as his second pokemon. The electric pokemon is able to get a few good hits in, but it is quickly worn down by a barrage of powerful attacks! It looks like Pikachu's battle is over until the electric pokemon unexpectedly channels enough energy to give it a second wind! After battling a bit longer, Satoshi switches his Pikachu out with his Naetle. The grass-type pokemon takes a Flamethrower attack from Hyouta's Zugaidos before knocking it out with a Razor Leaf. Satoshi is happy to have finally defeated Zugaidos, but he worries that his pokemon are too weak to continue the battle. Next up is Hyouta's Iwaku, and it quickly defeats the weakened Naetle in one hit! Satoshi calls his Pikachu out again, but the electric pokemon falls when Iwaku uses the shockwaves from a powerful Screech attack to send the pokemon soaring. Satoshi has lost the match against Hyouta, but the young trainer is determined to regroup and earn himself a Coal Badge. Can Satoshi do it? To be continued! It only took sixteen episodes, but we finally get Satoshi's first Gym Battle in the Shinou region. And, not surprisingly, he lost. While there were some moments where you really thought that Satoshi was going to pull through, our hero just wasn't able to defeat Hyouta this go around. We've all had battles in the games with some trainer that had that one pokemon who was almost impossible to take down, so seeing Satoshi face a similar challenge in Zugaidos is really nice to see. The dubbed version sticks out because of the amount of Japanese music that's left intact. No less than eleven tracks were kept in the episode, which is amazing considering the average is only about four to five pieces. PUSA pretty much left the second half alone (except for filling in some silent moments with their stuff), and I couldn't be happier. PUSA still has a ways to go with the music, but this really is a step in the right direction. Ammonite keeps its Japanese voice. Brock: "Try and understand that out of all of you, the only Pokémon good for battling a rock type is Turtwig, who's a grass-type." "The only Pokémon good for battling?" That's a little harsh, don't ya think? Originally, Takeshi just states that Naetle is really effective against rock-types. He doesn't talk down to Satoshi's other pokemon the way he does in the dub. Brock: "One thing I learned from watching Paul's battle with Roark was Paul's speed making up a huge part of the secret to his victory. Of course, his choice of moves was important too, but I think that amazing speed put him over the top." Originally, Takeshi was talking about the speed of Hyouta's pokemon, not Shinji's. This was right at the tail end of the episode, for those of you who don't remember. In the Japanese version, Satoshi actually apologizes to Pikachu. In the dub, Ash is just sort of trying to cheer his pokemon up or something.